We will set out on a journey of discovery to experience the architectural and natural wonders of the Ionian Coast to the north of Catania: majestic cliff stacks, picturesque towns and historic monuments. 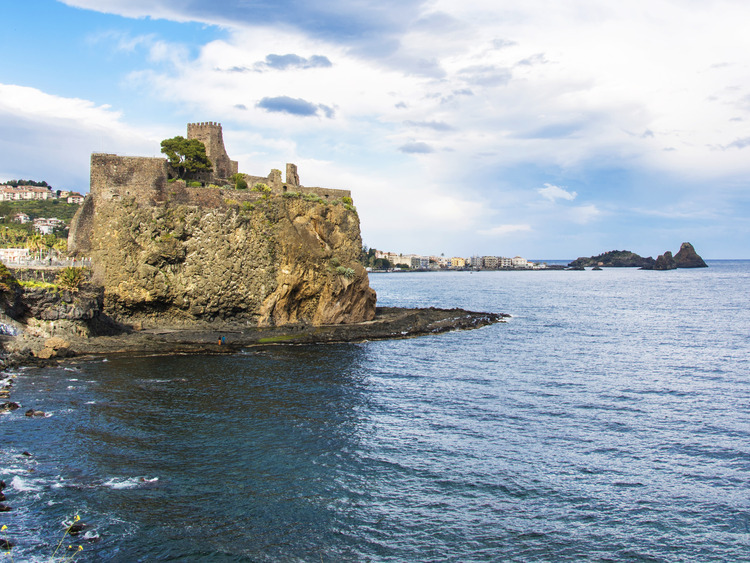 We will leave the port of Catania for Aci Castello, a town that grew up around a Norman castle, from which it takes its name, built on rocks made of lava that jut out into the sea. We will explore the towns streets before arriving in the square that is home to the Chiesa Madre church, built from volcanic stone. A spectacular lookout point provides an opportunity to admire the stunning panoramic views that stretch along the Riviera of the Cyclops. According to Homers Odyssey, its towering rock stacks were boulders thrown at the fleeing Ulysses by the Cyclops, Polyphemus. Our next stop is Acireale, near Mount Etna, located on a lava field among an expanse of citrus groves. Well-known for its churches, the towns beauty and imposing buildings ranging from Sicilian Baroque to the Neo-Gothic style are astonishing. After a pleasant stroll through this picturesque town, we will stop to indulge in a spot of shopping and some free time. We will then continue on to Aci Trezza, a small town located ten kilometres to the north of Catania along the Ionian Coast. It boasts a long maritime tradition and is an extremely popular destination during the summer. Famous for its breathtaking landscape, it was here that Giovanni Verga set his masterpiece I Malavoglia. With a last look at the magnificent views of the Riviera of the Cyclops, we will return to the port of Catania.